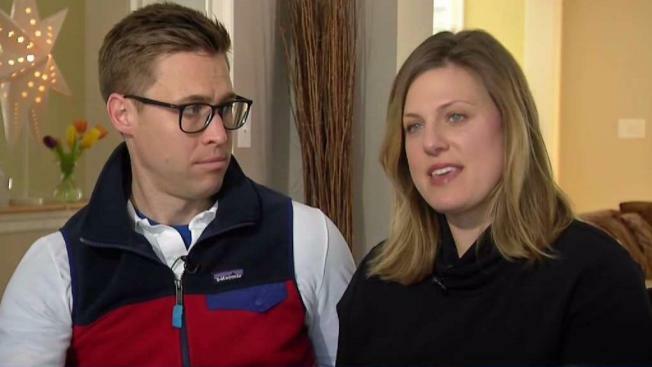 Proceeds from this year's Boston College MBA 5K will go to the Boston Strong scholarship, which honors marathon bombing survivors Patrick Downes and his wife Jessica Kensky. Runners are raising money to honor two Boston Marathon bombing survivors. The Boston College MBA 5K kicked off at 9 a.m. Saturday, and the race is put on entirely by graduate students at Boston College's Carroll School of Management. This year's proceeds will go to the Boston Strong scholarship, which is awarded to a deserving student with preference to those who excel with a physical disability or dedicate time to serve others. It was established by the class of 2005 to honor their friend and fellow classmate Patrick Downes '05 and his wife, Jessica Kensky. Kensky has said a big part of their healing process is her service dog Rescue whose goofy personality has been just as therapeutic as his ability to help navigate the world as a double amputee, which admittedly hasn’t always been easy. Kensky noted that a lot of kids would see Rescue and their prosthetics and be anxious to ask questions, so a friend suggested they write a children's book about Rescue and Kensky. Scott Magoon, their illustrator for the book, ran the marathon the year of the bombings, as well. He wasn't physically hurt but has said that illustrating the book has been a true joy for him. The book “Rescue & Jessica: A Life-Changing Friendship” went on sale last Tuesday.